It was snowing lightly when I came upon this field in Bucks County, PA, dusted with about an inch of snow. I loved the simplicity of the muted landscape, broken by the receding parallel spikes of corn stalks. It seemed to be a classic image of rural life. 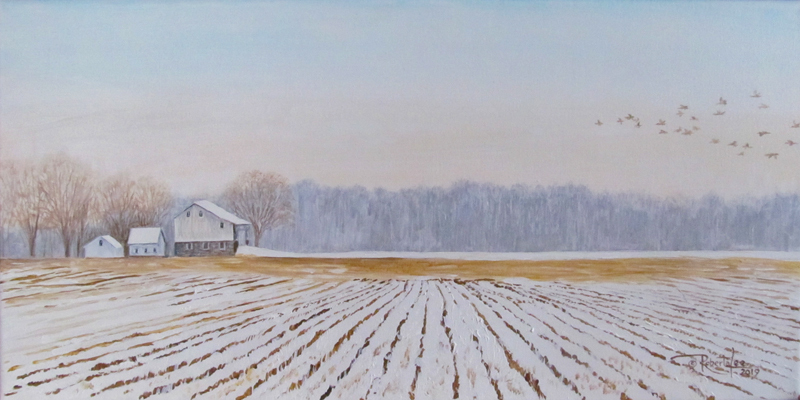 I also painted a companion piece, One to Two Inches, of the same farm from a different angle. Both paintings share the same limited palette of muted color: white, raw umber, burnt umber, ochre and ultramarine. And both were completed using color sketches I painted from inside my car, a strategy that has served me well in cold weather.